Cut boiled tongue into slices; fry them in a little hot butter, with a sprinkle of minced onion thrown in. Then, for the sauce, take out the slices of tongue; put in a tea-spoonful of flour, and when brown, a tea-cupful of hot water. When done, strain, and season with salt and pepper; add a table-spoonful of chopped pickles (piccalilli is best); however, common cucumber pickles may be used, with a little mustard added; or the sauce may be flavored with capers, or with both capers and pickles. Let the slices of tongue soak in the sauce until ready to serve, then arrange the slices of tongue on a platter, one lapped over the other, and pour over the sauce. 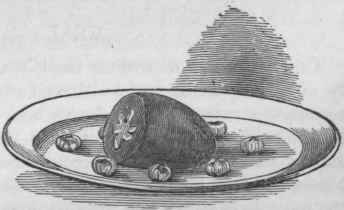 A beef tongue may be braised, and served with spinach or sauce Tartare, as described for sheep's tongues. 158): arrange a circle of the slices around a platter, and on each slice smooth a little hill (enough for one person) of spinach prepared as described in the same receipt for "sheep's tongues with spinach." Put either a spoonful of sauce Tar-tare or a slice of lemon into or on the top of each spinach-mold. This makes a nice lunch or dinner dish.